Perhaps there is a misconception that MMA fans are all redneck jocks who listen to Drowning Pool or Disturbed floating around and we here at All Elbows, probably evident in the design of this site already, are not such fans. In fact, I have personally not met these types, though I might have seen them booing in the stands at events, they are easy to ignore and avoid. Last week I opined about the superiority of Japanese MMA poster design and how US promotions are not close when it comes to creative key art, so it’s no surprise then I’m also the type to gain interest in a fighter who selects good walkout music. Tamdan McCrory, who came out at UFC 91 to Dimmu Borgir, had his request to walkout to Dethlok’s “Thunderhorse” at UFC 96 (from the show Metalocalypse) vetoed by Dana White. McCrory felt music to be so tied to his identity to the viewers he absolutely needed (Tamdan grabs the mic and its the first thing he addresses in his post-fight speech) to alert fight fans that his walkout music was not his choice. Now, I understand perhaps disagreeing with someone’s music choice for a broadcast because it may be offensive, but it was denied simply because White did not like the music. McCrory’s nerd-thing (putting his glasses on right after the fight and cursing awkwardly, yay) is very much his ‘brand’ and should be milked. 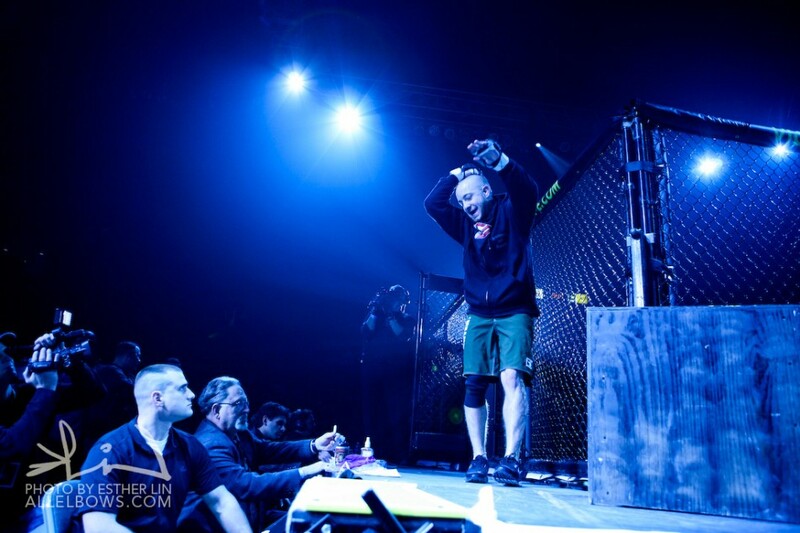 Walkout songs help fans identify with a fighter and while it may be a false assignment of either good or bad taste, I can’t help but judge a fighter by their walkout music and now I won’t know when a fighter is coming out to something substituted, or they if really like nu metal. Take Demian Maia for example. He used to walk out to the main theme from Last of the Mohicans. Every time I hear that song it gives me chills. It is a permanent part of my mental picture of Maia and makes me appreciate him beyond his sick jiu jitsu skills, and makes me more invested in him as a fighter and I want to tune in when he’s fighting. Music is such a big deal to fans, Tamdan’s music veto was the hottest topics on Fightlinker.com site, garnering more comments than all the other stories from the same day. FL’s prevous post on Chuck Liddell’s favorite metal bands got all the visitors riled up and comment pages filled up with ire and passion, everyone calling out their own top tens. I’m not sure what I’m trying to say here but I think music is really important to branding fighters’ personality. Sure, it’ll be dubbed over for the DVD or cut out entirely, but for the fans that tune in and pay, we want to experience the fighters’ as people, otherwise, why should I care who wins or loses? 2009/03/09 | Filed under MMA and tagged with demian maia, dethlok, dimmu borgir, joe wilk, metalocalypse, music, tamdan mccrory, ufc 96, walkout.